The NBA Center position used to have a few guys and then the rest were low end fantasy picks. In today’s NBA you have a great selection of Top NBA Centers to choose from especially when playing Daily Fantasy Basketball at FanDuel or DraftKings. The top NBA centers can fill up a stat sheet with points, rebounds, blocks and in some cases steals and assists. A double-double is almost expected from your pick for a fantasy center and find players that teams are running their offense through is what you want to look for. When looking for centers in daily fantasy basketball for the 2016/2017 NBA season we look for players that can fill up a stat sheet and get you that double-double while throwing in added points elsewhere. Some of the centers below will also qualify as a forward at most DFS sites. If you haven’t tried Daily Fantasy Basketball, you need to join both FanDuel or DraftKings. They are the two BIGGEST DFS sites to play for real money and they have FREE fantasy basketball games to try out where you can play for FREE CASH! But that’s not all! – Make your first deposit to either one or both fantasy sites and you will get an exclusive new deposit bonus of a FREE contest ticket to play in a cash game for thousands of dollars! When we talk about filling up a fantasy stat sheet Cousins immediately comes to mind. 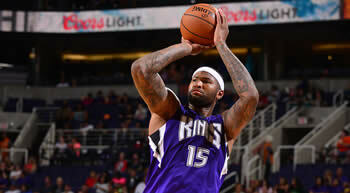 Average night for Cousins: 27 points, 11.5 rebounds, 1.5 steals, 1.5 blocks and a 3 pointer all while shooting over 50%. Usually the highest priced center of the night but worth taking when playing an undersized team which is when he dominates. Had a great rookie year and 2017 will only be better. The Timberwolves are a young team and they will be given the reigns to play and make mistakes with no pressure. Look for Towns when setting a DFS basketball lineup. Moving to Boston will be an adjustment but Horford is a veteran and so far in preseason the Celtics have played lights out when he’s been on the floor. Numbers may dip a bit in 2017 because of other scoring options in the lineup but still worth a pick. 3.7 Blocks per game to go with his double-double average per night. In his first full season last year he became a fantasy stud at center and he should improve on his numbers in 2017. The leading rebounder among centers also scores in the teens and gets blocks and steals. You pretty much know what you are getting when you pick Drummond for your fantasy basketball lineup. I would have put him a bit higher but there are other stars for the Clippers and that can hurt his fantasy value. He played well at the Olympics and will probably come in with even more confidence in his game. Has pretty much the same numbers year in and year out. He has been practicing his 3 point shot which would make him a more valuable fantasy center but don’t pick him for your DraftKings lineups hoping he starts to make it rain 3’s on a particular night. Moving on to the Spurs to take over for a Hall of Famer, this future Hall of Famer will fit in well. Be wary, Coach Pop likes to give his players breaks and rest when nobody is expecting it and it makes Spurs players a risky own any night they are picked. The other and much overshadowed Gasol is a very good center in his own right. Because there are other options he is usually a very nice value pick at FanDuel most nights and you can get him for a relatively cheap salary cap price. He may lose some minutes with new additions to the Magic but he still has too much talent to be sitting on a bench. Can score points and get you boards and has started to throw a few 3’s into the mix.